(SMS Center) is responsible for handling the SMS operations. -When a mobile generates a message, it first reaches the SMSC. SMSC then routes the message to its destination via Base Station/Tower. -For SMS Control Channel r used.So a mobile can receive messages even if a voice or data call is going on. 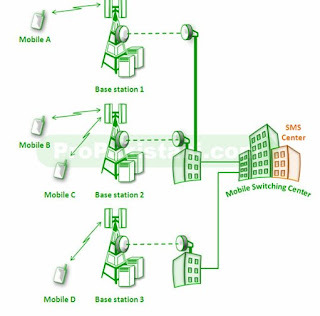 GSM (Global System for Mobile Communications) is a Digital Wireless Technology used for cell phone in the world that is, it is a cellular technology used for transmitting mobile voice and data services. It was developed by the European companies. The frequency of the carrier is very important, because it determines the Size, power, efficiency of your mobile phones. Radio signals are transmitted through electromagnetic waves, also called radio waves, in radio communication system. The radio waves have a wide frequency range starting from a few ten kilo Hertz (kHz) to several thousand Mega Hertz (MHz). This wide range frequencies is called the radio spectrum or RF spectrum. The RF spectrum is classified according to the applications of the spectrum in different service areas. The classification of the RF spectrum is given in below table along with the associated applications in communication system. Microwave is a kind of electromagnetic wave. In a broad sense, the microwave frequency range is from 300 MHz to 300 GHz. But In microwave communication, the frequency range is generally from 3 GHz to 30 GHz. Digital microwave communication is a way of transmitting digital information in atmosphere through microwave or radio frequency (RF). Microwave communication refers to the communication that use microwave as carrier. Digital microwave communication refers to the microwave communication that adopts the digital modulation. The baseband signal is modulated to intermediate frequency (IF) first . Then the intermediate frequency is converted into the microwave frequency. The baseband signal can also be modulated directly to microwave frequency, but only phase shift keying (PSK) modulation method is applicable. If the physical links are shared by more than two nodes/users, it is said to be Multiple Access.